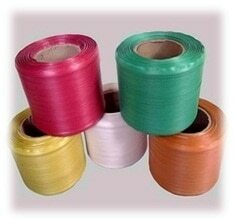 MANUAL STRAPPING ROLL The product is basically used in: News Paper & other Publications Houses, Copier & Stationeries, Home & Electrical Appliances Pharmaceuticals, Automobiles and Glass Products, Allied Engineering Products Motor & Pumps Industries, Flexible & Non Flexible Items, Wires & Cables Industries, Welding Electrodes & Explosives, Fruit/ Perishable & Non-perishable Goods, Solvent & Oils Industries, Ceramic & Sanitary ware products, Textile Yarns & Synthetics, Marine Products, Pallet Packing & so many such varied industries. Size Available: 12mm, 16mm, 19mm . Customized Printing Available On Dull-White & Super White . Quality / Grade Available: Re-Process (R.P), Dull-White (D/W), Super White (S/W), Virgin. Color Brightness as Per Quality. Weight: 12 mm = 2,3,5 kg. 16 mm = 2.5, 5 kg. 19 mm = 2.5, 5, 8kg. Customization Of The Product With Precise & Specific Requirement Is Also Entertained.